Since we first started the Windows Insider Program back in September 2014, Windows Insiders have helped us ship Windows 10 to over 300 million devices. We have released 35 PC builds and 22 Mobile builds to Insiders to date. This is a huge change from Windows 7 and Windows 8 which only had 2 and 3 public pre-release builds respectively. Windows Insiders have been more directly plugged in to our engineering processes for Windows than ever before, including participating in our first ever public Bug Bash this year. Windows Insiders contribute problem reports and suggestions which help us shape the platform, and are currently helping us get ready to ship the next major update to Windows 10 this summer – the Windows 10 Anniversary Update. This is just the beginning of the journey we’re on though. We really appreciate having such an amazing connection with our customers, and want Windows Insiders to continue to help shape Windows releases for years to come. With that in mind, I want to talk about a change to the Windows Insider Program going forward. When I was introduced as leader of the Windows Insider Program over 18 months ago, I was responsible for the team that built our feedback and flighting systems for Windows. It made sense for me to be on the front lines talking with customers of the systems that my team was building to get Insider Preview Builds out and hear the feedback rolling in. In August of last year, I changed jobs to work on the Engineering Systems Team in WDG. In this role, I am responsible for the tools our engineers use to build Windows, including our planning and work management systems, source code management, build infrastructure, and test automation systems. As with most things Windows related, the scale of these services is huge (we have 5 acres of build machines and move 35 exabytes of data per day for source, build, and testing activities.) Even though I changed jobs, I stayed on as the leader of the Windows Insider Program, working closely with the Fundamentals team who continued to build the Feedback and flighting systems. My career has always been about feedback, listening, and being customer-obsessed. When I first started at Microsoft, I started in product support taking phone calls from our customers. Even though I changed jobs, I wanted to keep managing the Windows Insider Program because I loved it so much. Over the past few months I’ve realized that I cannot give 100% to my main job on the ES, and also give 100% to the Windows Insider Program. And this program is so important to me that I really want to have the leader spending 100% of their time on it. So the time has come for me to pass the torch to a new leader for the program, and I’m thrilled to introduce you to her today. My attention will turn to being obsessed about our engineers at Microsoft as my “customers of the Engineering System.” I get to take everything that’s awesome about the Windows Insider Program and use it with our engineers internally. My goal is to ensure that we have the best engineering tools and processes in the industry, so that our engineers in WDG can respond that much more quickly to your feedback and suggestions, and deliver great new high-quality code to you in preview builds and released products. I won’t be going too far (after all, my team produces the builds that go out) and I will still be involved with the Windows Insider Program but will be much more behind-the-scenes from now on. I have worked with Dona for many years and think she is the perfect person to guide the Windows Insider Program forward. Her technical expertise, passion for customers, and commitment to listening to feedback is unmatched. She has deep roots in Windows, and started her Microsoft career as a software engineer during Windows Vista where she owned several device-heavy features such as AutoPlay, Bluetooth and Blu-ray integration into Windows. During Windows 7 and Windows 8, she owned the search end-to-end experience as well as a handful of other things including File Explorer and Open/Save dialogs. During Windows 8.1, she got to work on “magic” aka the Roaming/Backup/Restore platform for settings and app data. She also did a stint as the product lead for the Windows Driver Signing portal for Windows 10. Most recently, Dona has been working on the HoloLens developer experience, including the documentation, sample code, forums, Holographic Academy and #HoloHacks, the very first community driven holographic hackathon series. Dona is incredibly excited to take on this new role, and even when we first started talking about the possibility she was sharing great ideas and insights on where we can improve on the program going forward. She says that she has been “waiting for this job for 11 years”. You can follow Dona here on Twitter. Please welcome her as the new leader of the Windows Insider Program! Get to know more about Dona here from Microsoft Stories! The experience for me personally working on the Windows Insider Program has been exhilarating, humbling, surprising, and fun. I have been so incredibly fortunate to get to know many of you in person, at events like Build and Mobile World Congress, and virtually via Twitter. I couldn’t be more appreciative of all of your efforts and contributions. Every day working on this program I’ve felt so energized and excited about the fact that we are building Windows together. 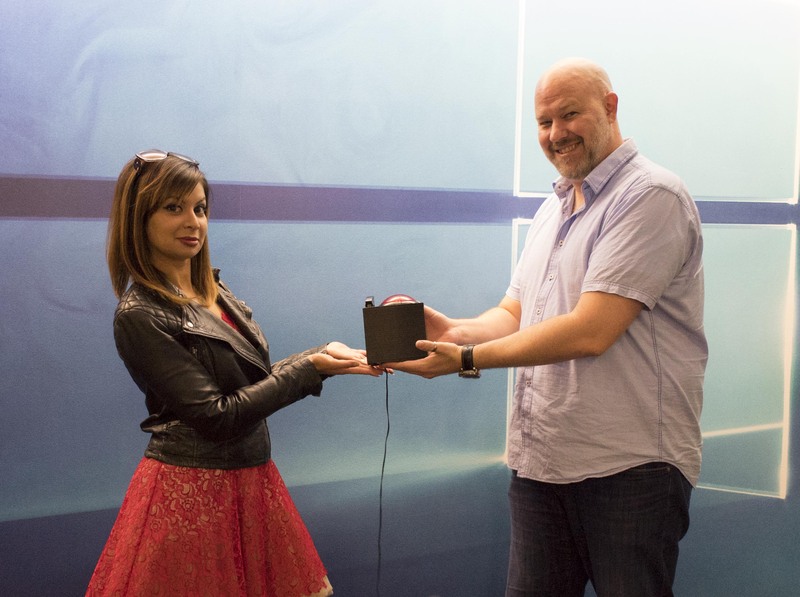 You are in GREAT hands with Dona, and I’m super excited to see how she takes the Windows Insider Program forward to be even more responsive and fun for all of you.